Greenwich, Connecticut socialite Jaspar Moran has it all-a magnificent estate, two beautiful children and a loving husband, Trevor, serving as the Secretary of the Treasury. Protected, admired and living in the lap of luxury, Jaspar is reeling from the news that his government jet has crashed just as her children vanish without a trace. An ominous message warns her to keep silent about her husband's role in the President's economic plan. Or else. Determined to save her children, she'll go to hell and back, form alliances with assassins, traitors and Mafioso, and commit unspeakable acts-if that's what it takes. With alarms sounding around the world, hunted from all sides, and unsure of who to trust, she finds herself depending on a mysterious figure without an identity. Jaspar journeys from the Australian outback to the palazzos of Rome, the Monte Carlo Grand Prix, and to the magnificence of the Vatican, in her quest. Can she rescue her children before the plot to crash the global economy is unleashed? Lately I have been reading a lot of fantasy so for a change, I reached for a suspense novel whose blurb looked really good. And with a woman as a main character whose motivations is protecting her children. Can't really go wrong, can you? Unfortunately, I have to say that you can. I wasn't impressed by either the characters or the plot. If I am reading this genre, I want the book to grab me, to make me care about the characters and what is happening. 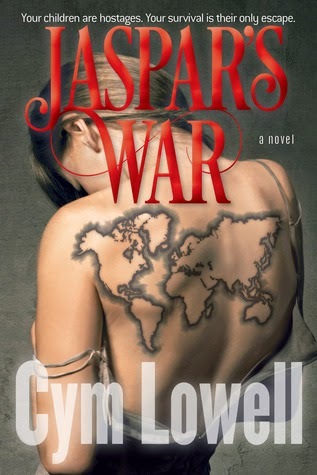 Instead, I found JASPAR'S WAR to start out in a disjointed manner where facts and backstories are flung at the reader in the beginning and then begin to plod along. I am still trying to figure how just how all the prayer furthered the storyline along. I can appreciate the lengths that Jaspar is willing to go for her children but I just couldn't really bring myself to care about her or any of the other characters. I found them to be flat and unrealistic. I really can't bring myself to recommend JASPAR'S WAR as I don't feel that it lived up to its potential. This is only the first book by this author however so I will keep my eye out for more.